1. Margaret STEWART, daughter of Sir James STEWART of Schillinglaw, 6th of Traquhair (c. 1534-1607) and Catherine KERR (bef1578-1606), married William BURNET. James BURNET ( - ). James was a Clergyman. He appeared in the census. He appeared in the census. He celebrated his Bar Mitzvah. 2. Sir James STEWART of Schillinglaw, 6th of Traquhair, son of Sir William STEWART 2nd of Traquhair and Christian HAY, was born circa 1534. He had the title '6th Baron of Traquhair'. He appeared in the census. He died on 9 March 1607. He married Catherine KERR. Was the youngest son. He inherited his title after his three elder brothers had in turn held it and then died, by which time he was a very old man. This James Stewart of Traquair was also variously styled James Stewart of Kirkland, of Innerleithen, and of Schillinglaw, the last being the most commonly used. He was a lieutenant in the King's Guard under his brother, Sir John. In 1604, Tweedie of Drava had some grievance against Lord Maxwell "for exhibiting Armstrong before the Council". Who this Armstrong was is not very clear, but it is interesting to note that the estates of the famous Johnnie Armstrong of Gilnockie, after his seizure and summary execution by James V in 1530 had been made over to Lord Maxwell and that Christie Armstrong, Johnnie's son, in 1557 got back the lands and further in 1562 was intrusted with the office of collector of the revenues of the Maxwell lands in Eskdale. Trouble was going on in many quarters at the same time; John and James Tweedie, the sons of Tweedie of Dreva are bound over not to harm William Linlythgow; and James Tweedie of Drummelzier not to harm William Hay of Linplum; George Tweedie of Calder in company with James Bailye is in trouble for attacking and wounding John Lowrie, and they are apprehended by the King's Guard and lodged in the Tolbooth of Edinburgh; Oliver Kay and James Tweedie burgess of Peebles have a difference with James Lowrie about "a complete stand of footmen's arms"; the feud between Lady Skirling relict of Sir James Cockburn and James Tweedie of Drummelzier still flourishes and Tweedie is again bound over not to harm her; Adam Tweedie, son of Adam Tweedie of Dreva and William Veitch of Kingsyde give a bond by John Tweedie of Winkistoun not to harm James Brown in Wester Hoprew, the bond being written by and subscribed before John Tweedie, notary in Peebles; James Tweedie, apparent of Dreva becomes security for John Tweedie of Innerleithen and for his son Adam not to harm James Stewart of Schillinglaw, the bond being witnessed by William and Walter Tweedie the sons of James Tweedie of Dreva; while Burke tells us that William Tweedie of Oliver, the son of a former William Tweedie of Oliver, had his cows oxen and horses stolen by John Batesoun, alias Jock of the Scoir, and was killed by him, Batesoun being afterwards hanged at Edinburgh for the crime. John STEWART (bef1594- ). John was born before 1594. 4. Sir William STEWART 2nd of Traquhair, son of Sir James STEWART 1st of Traquhair and Catherine RUTHERFORD, had the title '2nd Baron of Traquhair'. He married Christian HAY. 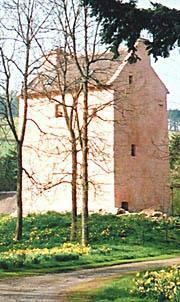 William's four sons were all successively barons of Traquair. Robert STEWART ( -1548). Robert had the title '3rd Baron of Traquair'. He/she died in 1548. John STEWART ( -1580). John had the title '4th Baron of Traquair'. He/she died in 1580. William STEWART ( -1604). William had the title '5th Baron of Traquair'. He/she died in 1604.